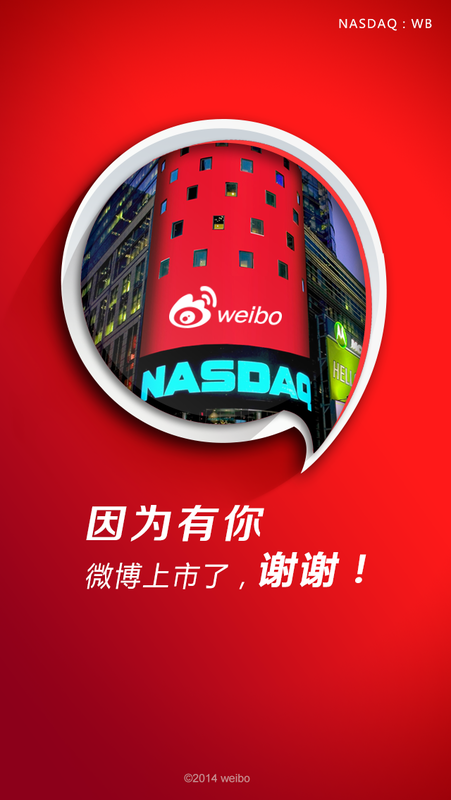 Now, Weibo will compete directly with social giants like Facebook and Twitter for the attention of U.S. investors. 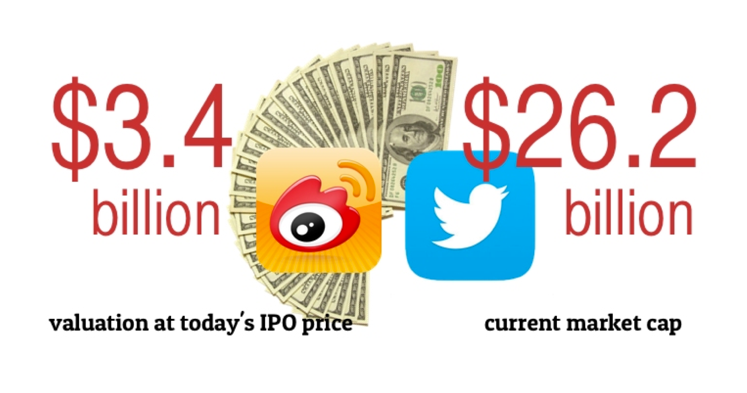 The first of China’s big 2014 IPOs arrives on U.S. shores this Thursday. The social network Weibo, commonly referred to as the “Twitter of China,” saw huge gains during its first day on the market in the U.S amid a particularly rough month for both IPOs and tech stocks. Shares of Weibo leapt 19 percent Thursday, from an IPO price of $17 to $20.24 when markets closed. Now it is even more valuable than its parent company Sina in the market. People who bought the shares are cheering for themselves now, or regretting not investing more. A huge success, right? Especially compared to the other tech stocks. The tech sector in general is has been on a slide for the last several weeks as investors abandon so-called momentum stocks. Weibo’s first URL is t.sina.com. The letter was used to show Sina’s respect to Twitter. Then the corporation changed its URL to weibo.com, and called itself Sina Weibo. Until March 27th. It is Weibo since then. No Sina. No T standing for Twitter. The word Weibo is the transliteration of “微博”. Wei means micro and Bo means Blog. Because the Chinese government has blocked Twitter and Facebook, it is one of the most popular sites in China. It was in use by well over 30% of Internet users. About 61.4 million active users by the end of December 2013. More than 500 million registered accounts. About 100 million messages are posted each day. 70 percent of the users manage their accounts on mobile app. Quite impressive numbers. But what’s behind that? Advertisings, bad languages, or “zombie fans”, which means fake followers. The messages gain most reposted are all celebrities news. An actor cheated his wife, a CEO dates a college girl…. Many people like to blame Weibo’s challenges to the government’s censorship. Actually, the user activity is reduced in many ways, and the company is not innocent in the process. For instance, 70 percent of the users manage their accounts on mobile app, but the official app from Weibo Corporation itself is not user-friendly. The third-party app Weico is much more popular among the users. Weibo has a special identification system. You need to apply to become a VIP user, just to convince other users that the account is not cheating. If you are a company or an organization, you will get a blue V sign on the right of your account’s name; and for personal account, a yellow one. But Weibo doesn’t set up a good authentication system, and many accounts get the yellow or blue V with fake identifications. Weibo is working inefficient in protecting users’ privacy. During the register process, users need to provide their ID number, which means the accounts are autonym. Weibo should keep all these personal information safe and secret. But it is quite easy to dig it out. Now the managing team of Weibo will put the hot topics on the top of the page, above the input box. However, algorithms do not decide who are on the top. 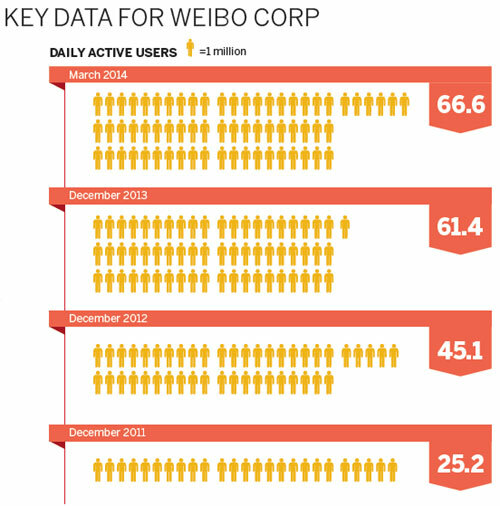 Weibo’s manage team make the final decision, according to the popularity, political concerns, or the profit they can earn. The manage team is the new gate keeper in the Internet Age. I bet they are not as professional as those working for the tradition media. Chinese have our own social networking system. We have Renren instead of Facebook, we have Weibo, instead of Twitter, we have many video sites instead of YouTube, and we have WeChat instead of WhatsApp. WeChat is owned by Tencent, another large Chinese Internet corporation. Weibo has a service call “long passages.” If you want to publish some long articles or passages, you can use this service and the software will transfer your article into an image form. It is such function that killed Sina Blog. Sina cut a strong arm of itself, and put on a iron one. Now, WeChat, a steeled arm has taken its throat. Weibo has rarely taken its social responsibility. Google is always appreciated for its informal corporate slogan “Don’t be evil.” But Weibo or its parent company Sina are never such companies.